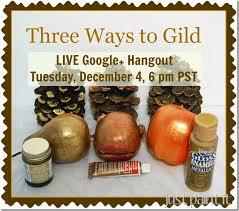 Gilding is typically done with gold leaf, which is stunning but also costly and time consuming. This three methods I’m sharing tonight are quick, easy, and won’t cost you your first-born. The first product I used is Martha Stewart Liquid Gilding by Plaid. I used “Brass” in the video, but it has a brilliant gold finish. Prices range $5 and up, depending on the store/website. Second, I shared Rub ‘n Buff in Antique Gold – my personal fav. Rub ‘n Buff is a great wax that can be applied with either a brush or your finger. And, of course, you can buff the finish to a high sheen if you apply it to a flat surface. Rub ‘n Buff also costs around $5. I also used Glorious Gold by Americana Paints, available in most craft stores. This particular shade of gold is rich & lusterous, imo. I use all kinds of gold paint, but to achieve a gilded effect, Glorious Gold is the closest match. Glorious Gold is also wonderful for an antique gold finish, like the one I applied to the thrift store frames. Have you gilded anything this year? What’s your favorite product?